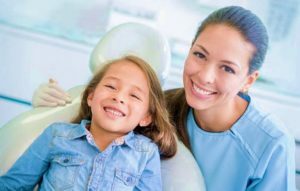 At Carson & Carson Dental office, we have extensive experience in teaching children how to feel comfortable about seeing their dentist and caring for their dental health. Our encompassing approach to Pediatric care involves both teaching and promoting healthy dental habits to your child and providing you with the educational resources necessary to keep your child’s smile healthy and beautiful. Trust your child’s teeth with one of the most experienced children’s dentists in all of Ventura County. Schedule a visit to the Oxnard dentist with over 45 years of experience in Pediatric & Adult Dentistry – Carson & Carson, DDS (805) 983-0717. Early examination and preventative care will protect your child’s smile now and in the future. Trained and weathered in the specialty of Pediatric Dentistry, both of our dentists Dr. LeRoy Carson and Dr. Derek Carson provide a caring and comfortable environment for kids that parents can appreciate. Both of our dentists are also experienced parents that understand how to create a child-friendly dental experience for our younger patients. What if my child fears the dentist? Young children and those with high anxiety levels might benefit from the use of a minor sedative during their first dental procedure. Should your child need it, our dentists are certified by the State of California Board of Dental Examiners in using IV sedation & IM sedation for dental procedures. For more information on the types of sleep dentistry services we offer, click here. Below, we have listed some useful tips in handling various Pediatric Dental Emergencies.Click here for Adult Dental Emergencies. Toothache: Immediately clean the area of the tooth in question. Apply ice to the face to control swelling if necessary. DO NOT apply heat or aspirin to the gum where the toothache is occurring. Rinse mouth with warm water and use floss to dislodge any food that may have gotten stuck around the tooth. Persistent tooth pain is nothing to mess around with, as it can often require root canal treatment to fix and only gets worse when left untreated. Don’t hesitate to call your child’s dentist immediately if he/she has a stubborn toothache. Knocked-out Permanent Tooth: Don’t lose the tooth! Time is the crucial factor in saving a knocked-out tooth. If the tooth must be rinsed, only use water, never use soap or scrub the tooth. Only transport the tooth in milk or a cup full of saliva from the mouth where the tooth is from. If the tooth has no fractures and is still solid, a dentist can attempt to place it back into its socket if you seek professional help for the situation immediately. Knocked-out Baby Tooth: Typically, no treatment is necessary. Baby teeth are not replanted into the mouth because that can cause damage to developing permanent tooth under it. Chipped/Fractured Permanent Tooth: The longer you wait to contact your dentist after chipping a tooth, the higher the rate of infection is. Rinse the mouth out with warm water and bring the chipped piece with you if you can find it. Possible Broken or Fractured Jaw: Prevent the jaw from moving around and take your child to the nearest emergency room. These children all suffer from infant bottle tooth decay, milk caries. Once the front teeth enter the mouth, a child sleeping with milk on his teeth will cause decay. I have seen breast fed children, as well as bottle fed children develop this dental pathology. View more of these cases on our page featuring Pediatric Dentistry Case Studies. Serving Oxnard for over 45 years, we are weathered and experienced veterans of the dental industry. Our nurturing dental professionals can help you and your family achieve a lifetime of happy and healthy smiles. Make an appointment today with our Oxnard office at (805) 983-0717.